The entrance to Journey Behind the Falls is located in the Table Rock House Plaza on the Canadian flank of the Horseshoe Falls. Here you descend by elevator 125 feet (38 meters) to a 185 foot (56 meters) long tunnel that connects to an outside viewing platform. 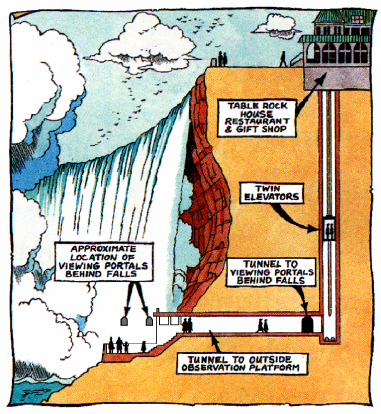 A second tunnel encountered 60 feet (16 meters) beyond the elevator extends to the southeast and connects with two portals that allow you to view the Horseshoe Falls from behind. The 52 foot (16 meters) long tunnel to the Cataract Portal is encountered after 200 feet (61 meters). It is located at the edge of the falling water. Measurements with a laser rangefinder indicate that you are 18 feet (5.5 meters) from the falling water. 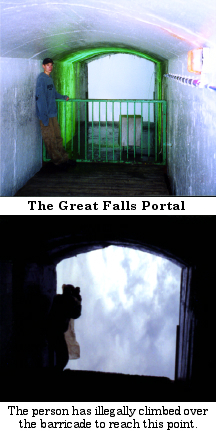 The tunnel to the Great Falls Portal is located 161 feet (49 meters) further on and is also 52 feet (16 meters) in length. Measurements with a laser rangefinder indicate that you are 24 feet (7.3 meters) from the falling water. Note: The tunnel measurements were taken by Tom M. and Falzguy on 10/25/2003. 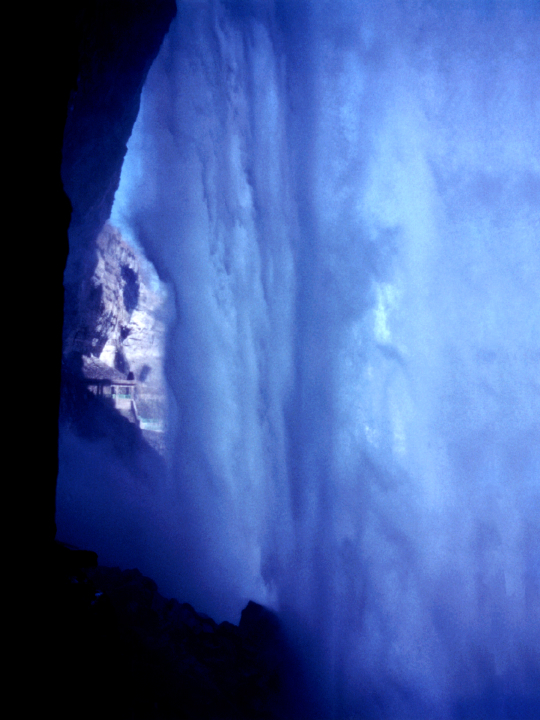 This photo was taken from the very end of the Great Falls Portal on December 11, 1998. The outside observation platform is visable to the left of center.